State Finance Minister T M Thomas Isaac tweeted that though the state had shown the 'tradition of hospitality' by permitting Shah to land in the airport, which had not been formally inaugurated, the BJP leader had threatened to oust the left ruled Kerala government. The official inauguration of the Kannur airport, the fourth in the state, is scheduled to be held on December 9. But, by arriving in a special flight there yesterday to inaugurate the BJP's new district committee office, Shah has unofficially become the first passenger to land in the airport at Mattanur in Kannur. Isaac said shah's "empty threats" were out of frustration as the saffron party is yet to get more members in the state Assembly. Former Union minister, O Rajagopal, is the lone MLA of the BJP in the house. "Amit Shah permitted to land in Kannur airport which is yet to be opened. That is our tradition of hospitality. But he is threatening to oust Kerala government. Such empty threats do not frighten us. Try to win few seats in Assembly. Your frustration is understandable," Isaac tweeted. Hundreds of party workers had gathered Saturday at the airport to welcome Shah who was in Kerala on a day's visit. After inaugurating the party office located at Thalikkavu, he had made a scathing attack on the CPIM-led LDF government in the state over the Sabarimala women's entry issue and pledged BJP's support for it. Main opposition Congress took on the LDF government for allowing the BJP Chief to use the airport. Kerala Pradesh Congress Committee president, Mullappally Ramachandran alleged that Shah landed at the airport following an 'understanding' between him and Chief Minister Pinarayi Vijayan. "At a time when the Kannur airport is scheduled to be inaugurated on December 9, it was specially opened for Amit Shah. Usually, it is done so during emergency situations," he said in a statement. Amit Shah had arrived in Kannur Saturday on a day's visit to Kerala to attend a party function in that city and the 90th Mahasamadhi observance of saint social reformer Sree Narayana Guru at Varkala near Thiruvananthapuram. 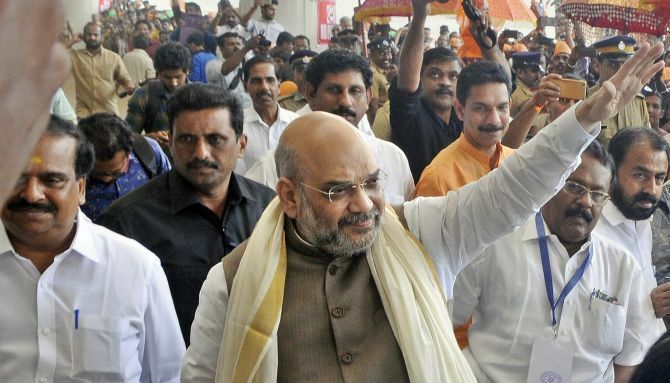 Later, in a hard-hitting speech, Shah had warned Chief Minister Pinarayi Vijayan that he would have to pay a "heavy price" if the (attack on Ayyappa devotees) continues, as BJP workers "would not hesitate to pull down the government."